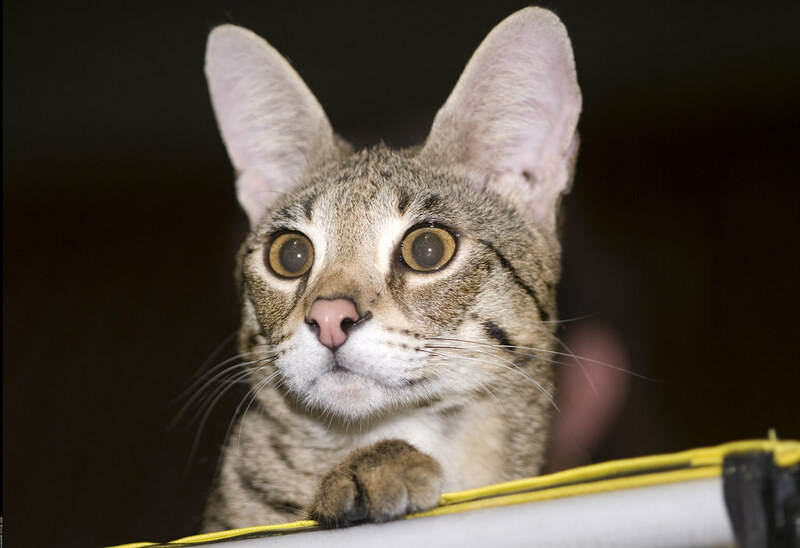 Considering the Savannah cat breed as your next family cat? This breed is unlike any other and has some things to consider. Learn what you need to know from traits, health to where you can get a kitty! The Savannah cat breed brings a touch of the wild into the homes of everyone that pet parents this remarkable feline. However, the Savannah isn’t your typical domesticated pet. This unusual kitty has some very unique roots that need to be considered. Before you bring a Savannah home, this post will tell you what you will need and want to know. The date was April 7th, 1986, when the first Savannah kitten was born. Bengal Breeder Judee Frank paired her female Seal Point Siamese and a male Serval belonging to Suzy Wood. Although neither expected the beautiful result, this new breed would go on to gain popularity with cat fanciers all over the world. The first kitten (F1 or first generation hybrid cross) was christened “Savannah,” to signify the African grasslands that are home to the Serval’s ancestors. With Savannah, Wood was able to breed the first known F2 (second generation) Savannah cat. Because of this animal’s unique qualities, it wasn’t long before an interested buyer, Patrick Kelly, obtained one of the kittens. But Patrick Kelly didn’t just want a pet, he wanted to produce a new breed of domestic cat, and enlisted the aid of cat breeder Joyce Sroufe to assist him. After much painstaking research and many steps, Kelly and Sroufe were able to produce a new feline breed successfully. 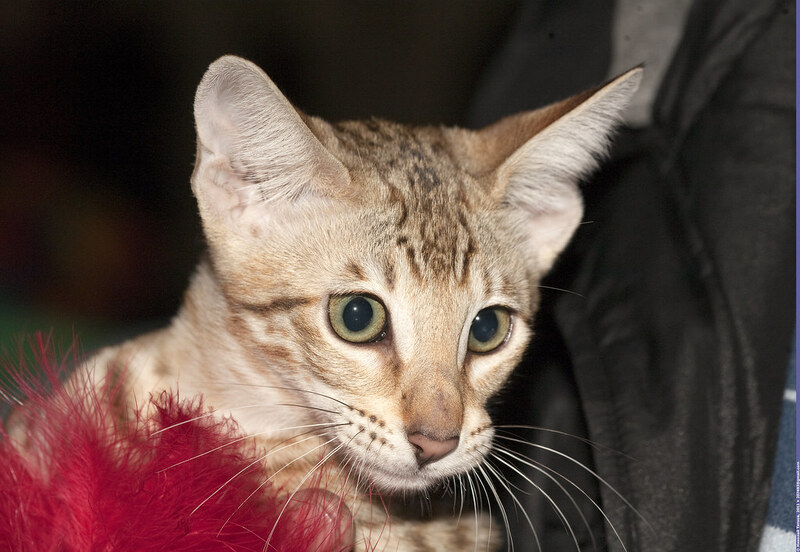 The Savannah got its recognition from The International Cat Association (TICA) as a New Advanced Breed Class in 2001. The exotic appearance of the Savannah is breathtaking. This breed sports a spotted coat with bold markings. It has a lean, muscular build, and even though it may look large, it is considered a medium-size feline. The remarkable coat of the Savannah can vary in colors from brown, tan or gold with black or dark brown spots to silver with black or dark grey spots to black with black spots and black tipped silver with black spots. Other unique features of the Savannah include its tall ears, hooded eyes (which are flat on top), and long neck, legs, and body. There is nothing simple or ordinary about this feline! Just like the Savannah’s bold appearance, is its bold and boisterous personality. This breed loves to be active and busy – expect to find him on top of everything including the refrigerator. The Savannah bonds strongly with his family members, so be prepared for a constant companion following you around the home. This feline is loyal and loves to chatter up a storm or show his affection through headbutts. This cat does best with a person or family that will entertain him with tough toys, loving devotion and maybe even the occasional swim in the bathtub. That’s right! The Savannah loves the water, so keep those toilet seats down. When raised with and appropriately socialized, the Savannah can enjoy life with other cats, children, and even dogs. And since the Savannah is highly intelligent, you can easily train him to walk on a leash, do tricks, and fetch. 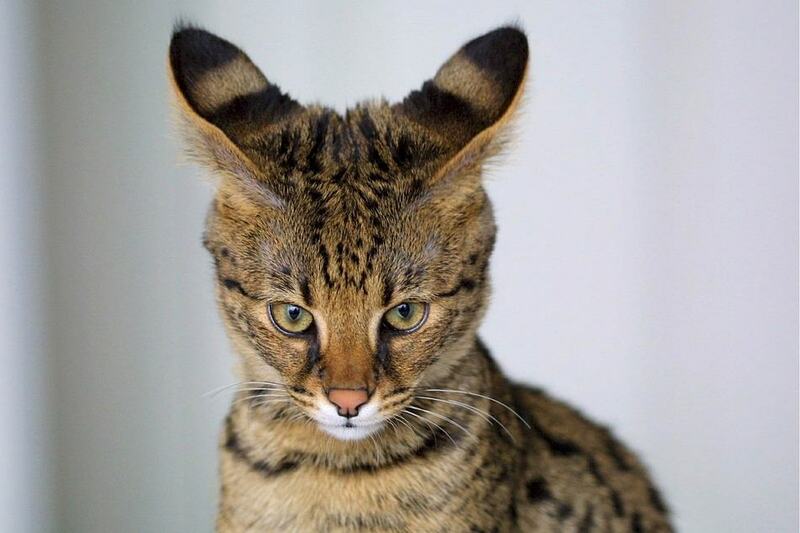 Although there are no known significant health issues of the Savannah cat breed, they can be susceptible to the same conditions as other domesticated felines. Savannah pet parents do need to be aware of the types of toys they are allowing their Savannahs to play with, as obstruction due to ingestion has been reported. Inappropriate toys that are flimsy or easily destroyed are not recommended for this sturdy breed. These include such toys that are too small, lightweight, and easily swallowed. Before your Savannah has any surgery, your veterinarian should establish whether your pet has inherited a smaller than normal liver (this is from the Serval lineage). If so, ketamine should not be administered, as this drug is metabolized through the liver, which can cause serious health issues. All cats need a high protein diet; the Savannah is no exception. To keep your fur baby healthy your Savannah’s diet should consist of a protein-based diet. High-quality, pure proteins found in chicken, beef, duck, and fish are necessary to keep your cat in optimal health. Another reason protein is a vital substance for your Savannah is the breed is prone to having a deficiency in taurine – taurine is found in meat. When searching for dry or wet food for your cat, be sure the first ingredient is a named protein, and the food is low in grains, especially corn, wheat, and soy. Savannah pet parents should be prepared to provide their pet with plenty of mental and physical stimulation. This breed needs to be challenged and can get destructive and even depressed when not being exercised and played with daily. Be sure to keep your Savannah’s nail trimmed, coat brushed, and their teeth clean.Although daily oral hygiene is optimal, once-a-week is better than nothing at all. 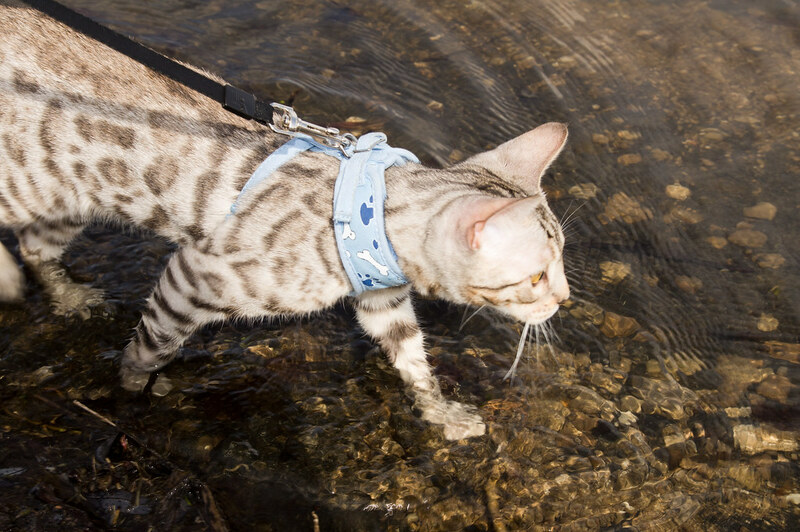 Savannahs love to chew electrical cords, houseplants and anything that tickles their fancy, be sure to secure these objects to ensure your cat is out of danger. Lastly, even though your Savannah may look like a “wild” cat, keeping her indoors is still the safest choice. Outdoor felines are put into harm’s way through contact with other animals, traffic, and cruel people that may want to harm, or even steal your Savannah. If you have decided that a Savannah is the right breed for you, then be sure to research out a reputable breeder. People who refuse to disclose information on the lineage of the kittens or won’t show you the parents are most likely hiding something. Kittens should be properly socialized while with their mother. When viewing a litter of Savannah kittens, look for ones that are interacting with their surroundings. Timid, fearful, of skittish cats are not what you are looking for in a Savannah. A Savannah kitten should have bright eyes, a soft, shiny coat, and be well-toned. Skinny kittens or those that have visible ailments (weeping eyes, dirty ears, underweight) should be avoided. Savannah kittens are very pricey. Depending on the generation you are getting they can start at around $1,200 all the way up to (and beyond) $5,000! 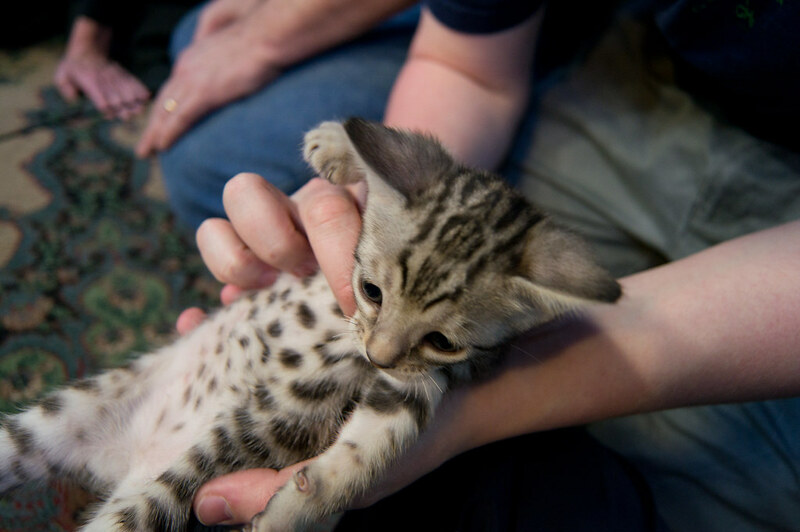 According to F1’s Hybrids, Savannah Cats, sometimes bottle feeding is required in the first generation of kittens. This is due to the difference in gestation between a domesticated cat and the Serval (a domesticated cat is around 63 days, the African Serval Cat is about 74 days). Ask the breeder you are researching if their kittens were born prematurely. The Savannah cat breed brings a touch of the wild into the homes of all those pet parents that are ready to embark on the journey. Be sure you are prepared to take this feisty and fantastic feline on! Do you have the Savannah cat breed? Share your thoughts and tips below! Great information! I’m so glad I found your site. We are actually thinking of adopting a cat or kitten for our kids. They have been begging us for YEARS!! We are trying to find the right fit for our busy lifestyles. Your site will be a big help. This is a great help, I adopt a lot of stray cats in our area, however, if ever we needed to have a cat with a breed, this would be one of our options! So a 30 pound intelligent cat that headbutts and fetches is kind of the dream! They sound so adorable and maybe like a “gateway cat” for dog people like me. Awww this breed is too cute. I’d love to have one but my partner hates pets. I’ll ask my parents to buy it for me. HAHAHA! 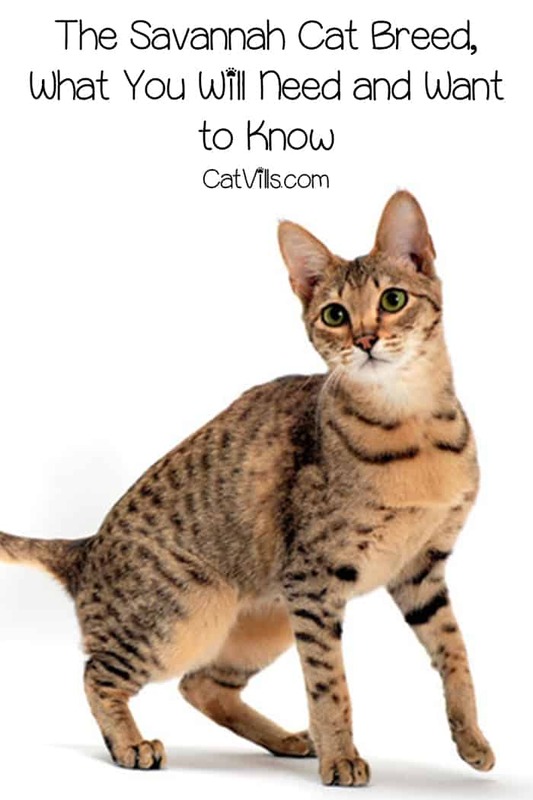 A very detailed information about the Savannah cat. 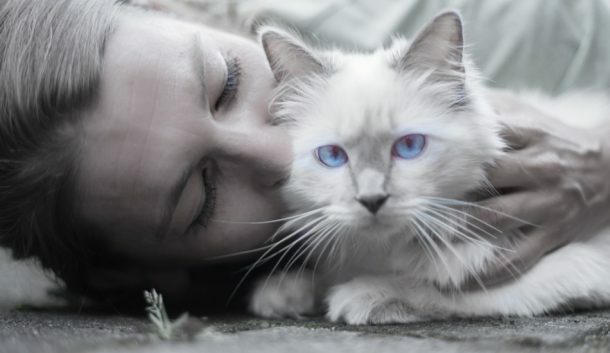 I would love to a cat from this breed. I didn’t know about this breed. To be honest I always resque stray cats and haven’t had a breed cat living with us. They are very pretty though!